Uganda is one of the safe birding destinations in the whole of African continent .The country boasts of over 1000 unique bird species and these are distributed in different protected areas of Uganda. The different bird species protected in national parks can be watched by any traveler who under takes birding safaris to Uganda’s protected areas like Queen Elizabeth national park. Queen Elizabeth national park is one of the famous birding destinations in Uganda where travelers on Uganda safaris can easily enjoy the sights of different bird species. The diverse natural habitats that range from the savanna vegetation to lowland forests as well as wetlands support wide range of bird species which can be viewed by travelers on their birding safari tour to Uganda. Queen Elizabeth National park which boasts of over 600 different bird species is the best area where tourists on Uganda safaris can enjoy memorable bird watching encounter. The park that covers a total area of 1 978 square kilometers offers wide area where travelers on their Uganda safari tour can easily maneuver while looking for different unique bird species. 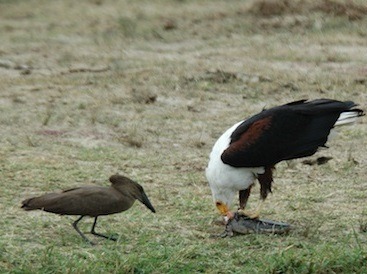 The appropriate way you can encounter the unique bird species in Queen is by booking safaris to Uganda. Your safari to Uganda will connect you to Uganda’s second and most visited park-Queen Elizabeth national park .While at the park, you will have the chance to listen to the nice melodies of the different bird species supported in the diversify natural habitat of Queen Elizabeth national park. Among the list of birds you will have glimpse and close account that include the species of the Fish Eagle, African Jacana ,White-faced Whistling , Squacco Heron as well as the bird species of the White and pink backed Pelicans, Long tailed Cormorants, Spur-winged Plovers, among the many different bird species housed in the park. By the end of your Uganda safari, you will prove that Uganda deserves to be number one bird watching destination in the world. Despite of the fact that Queen Elizabeth National Park is number one bird watching destination, it’s also one of the endowed national parks with rare wildlife species including the rare tree climbing lions in the Ishasha region, Elephants, leopards, water bucks, hippos, crocodiles among other wildlife species. Therefore your bird watching safari tour to Uganda’s Queen Elizabeth National will offer you combined opportunity to view the birds and wildlife protected in the park.